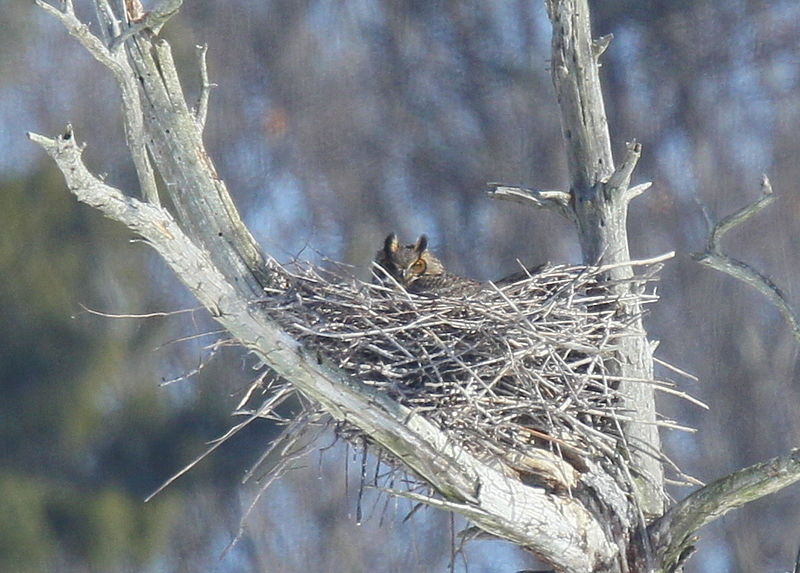 The Great Horned Owl has returned to nest again in the Great Blue heron Rookery located just to the west of the Methuen Rail Trail along the Spicket River. This area is part of the Nevins Bird Sanctuary. It is a busy and growing Great Blue Heron Rookery and the herons will be arriving shortly! 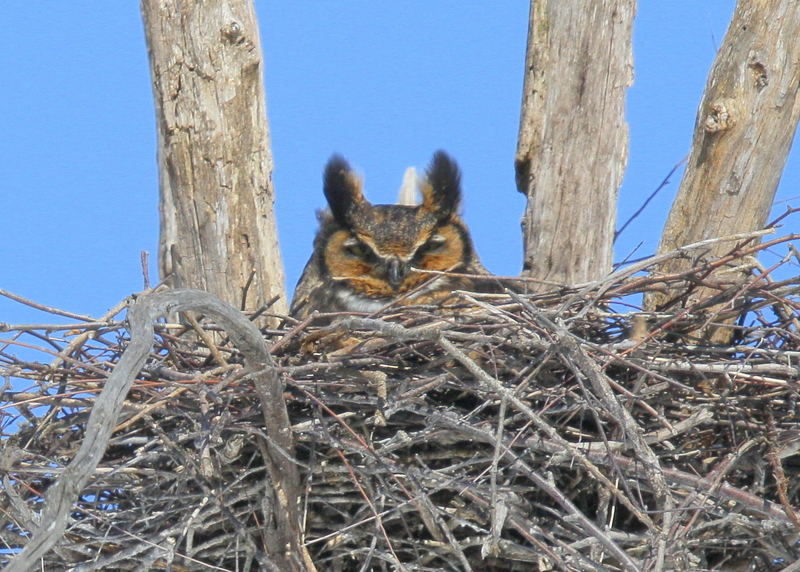 The nesting Great Horned owl has returned again to the Carter Field Reservation in West Boxford. The Owl is found in the middle of a Great Blue Heron Rookery located in a dead tree swamp. The number of nesting Herons in the rookery has been reduced considerably in the last few years due to winter storms and other factors. The bast vantage point may be from the trail off of Bradford Street. 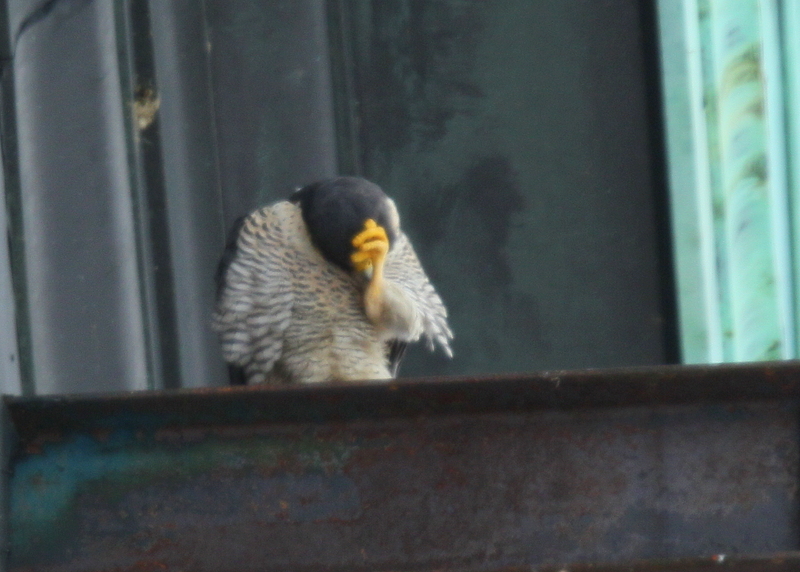 Peregrines seen on the Clock Tower together! The clock is ticking down to the start of the peregrine breeding season. Since the historic Lawrence matriarch female has been retired to the Tufts Wildlife Clinic, the male has attracted a new female friend. They continue to spend lots of time together. Initially they have been seen mostly at the Verizon Cell Tower. 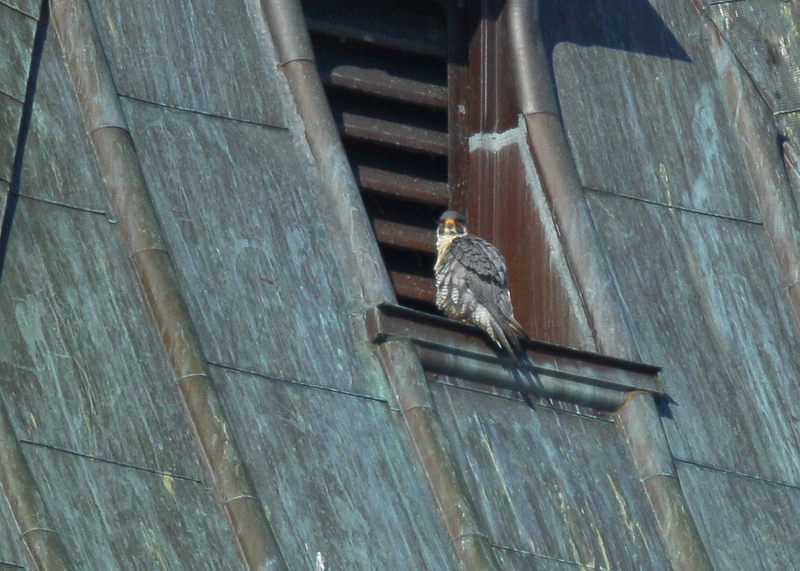 Then the female started to be seen solo around the Clock Tower perch locations. This morning she was perched on one of the ledges above the east clock face while the male was above on one of the window sills just below the base of weather vane also on the east side of the building. Very encouraging signs as we may be less than 4 weeks away from first eggs being laid! The Verizon Cell Tower continues to provide an active perch location most likely due to hot air exhaust vents on the south side of the building! The peregrines are now being seen together more often. On colder days they are found near the hot air vents on the south side of the Verizon Cell Tower. They certainly seem to be spending more time together and it sure seems like love is in the air between these two! Here the keep an eye on each other from nearby perch locations! 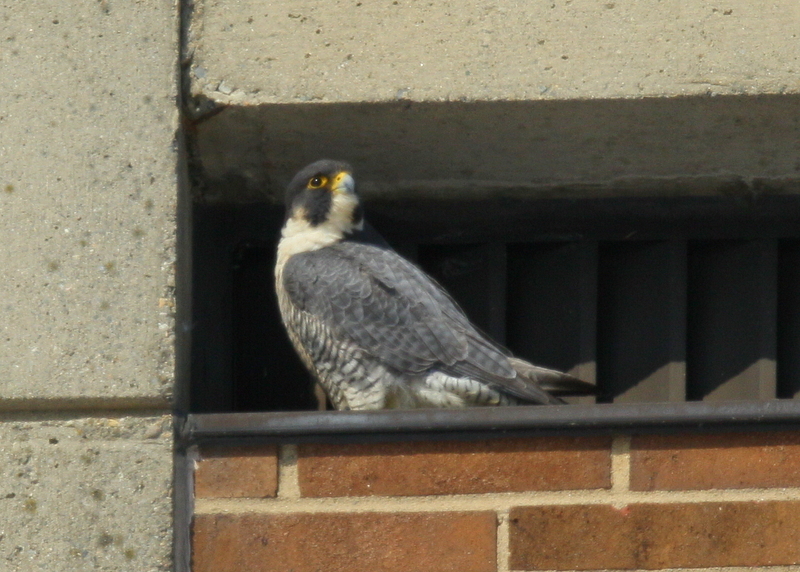 The male Peregrine has been moving back and forth between the nearby Verizon Cell Tower on the north side of the river and the a number of the regular perch locations around the Clock Tower complex. 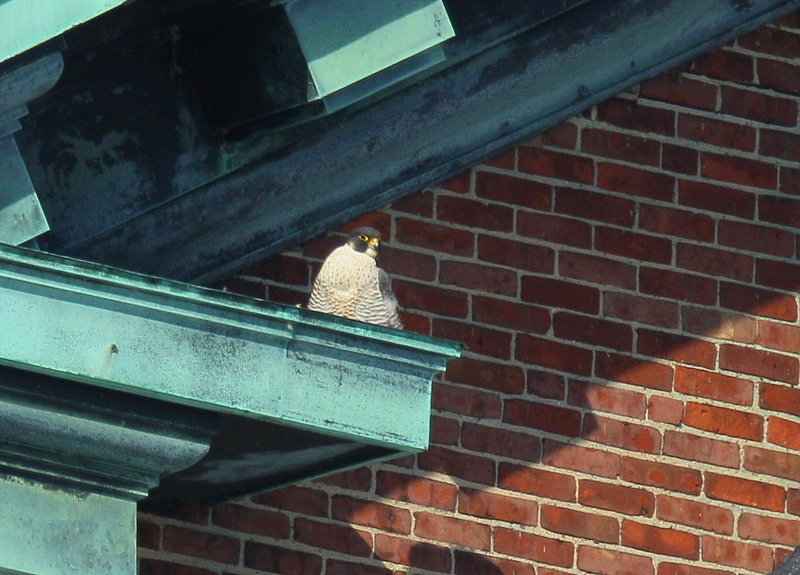 This morning, the male, with silver federal leg band in view, was perched on the rooftop corner above the entrance to 200 Merrimack Street. It was fascinating to watch the peregrine go through a bill cleaning process, likely after having a meal. It was quite cold but with blue skies and bright sunlight! 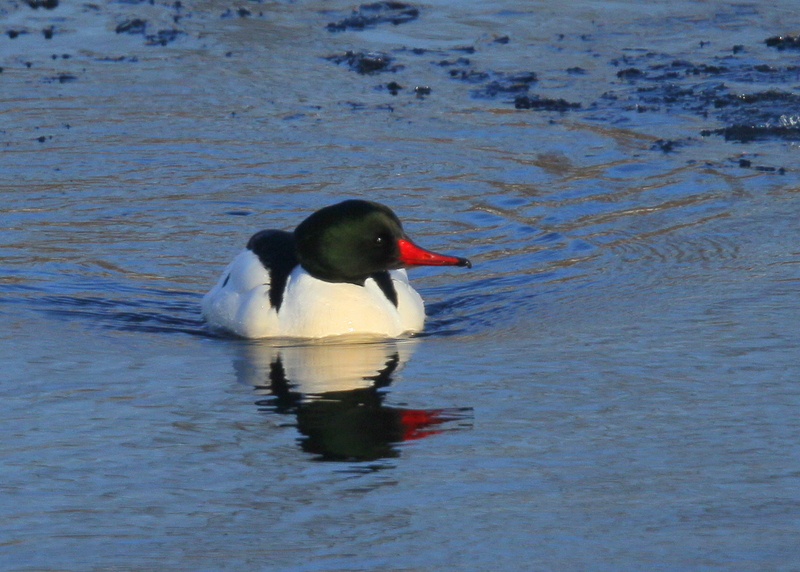 The Common Mergansers have been seen on the Merrimack River in Lawrence over the past 2 months. Both males and females keep busy diving for fish. these Mergansers are beauties with the creamy white breast and flanks, dark backs, greenish black heads and bright red serrated bills used for grabbing fish! 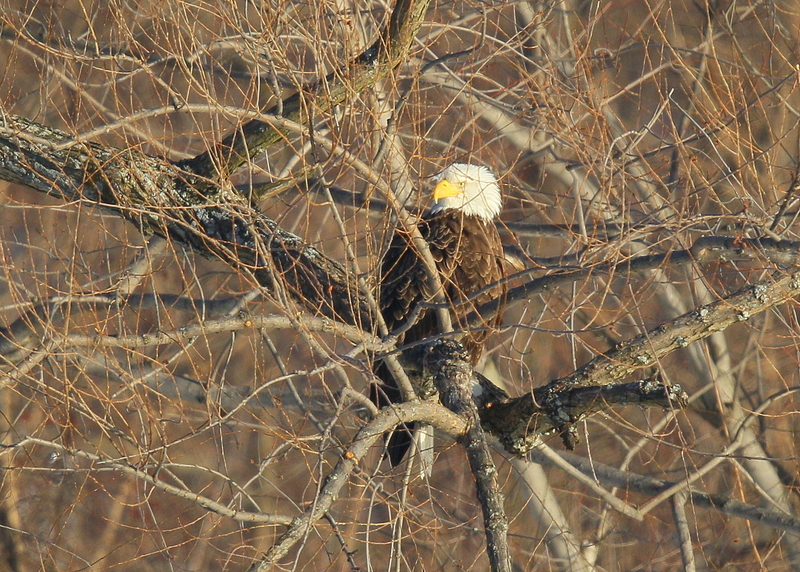 After attending the early Mass on Ash Wednesday, a priest friend wanted to see where the Bald Eagles perch along the Merrimack River in Lawrence. We headed over to the parking lot on the west side of NXStage Medical Inc. at 350 Merrimack Street. We scanned the other side of the river and enjoyed nice looks of this adult perched right opposite our location in the bitter cold but bright sunlit morning! 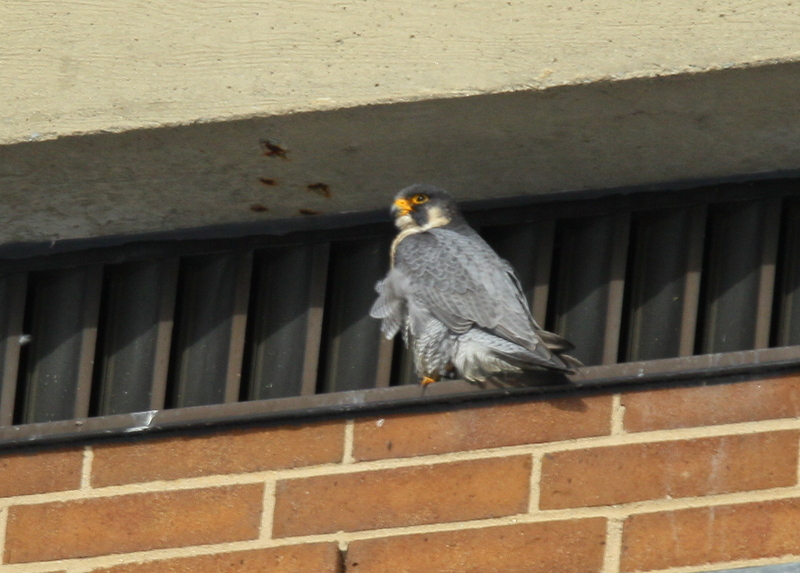 Peregrine female near Clock Tower! 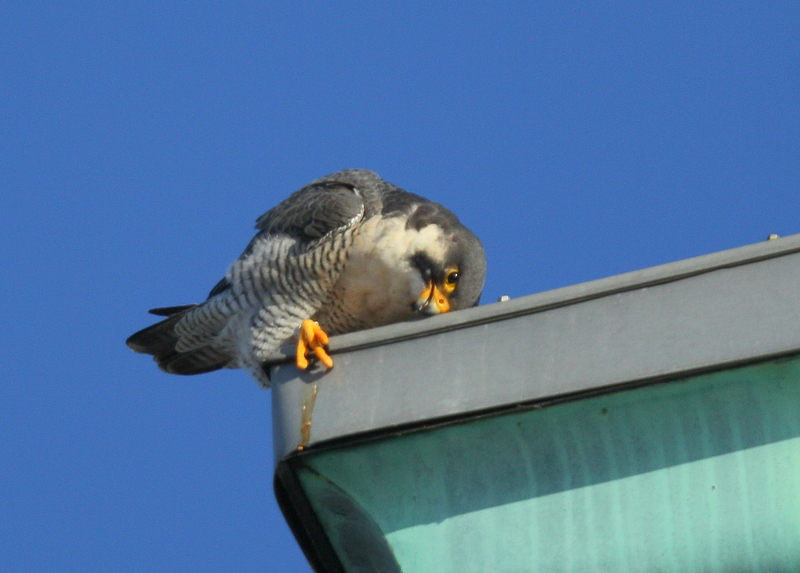 The new female peregrine has been making visits to some of the regular perch locations around the Clock Tower. This morning she was seen hanging on the short black iron beam just below the roof line on the south side of 200 Merrimack Street. This has been a very regular perch location this time of year. It provides a nice spot out of the wind and in the morning sun. She is seen here scratching her head and showing no leg band! Peregrine male atop the Cell Tower! 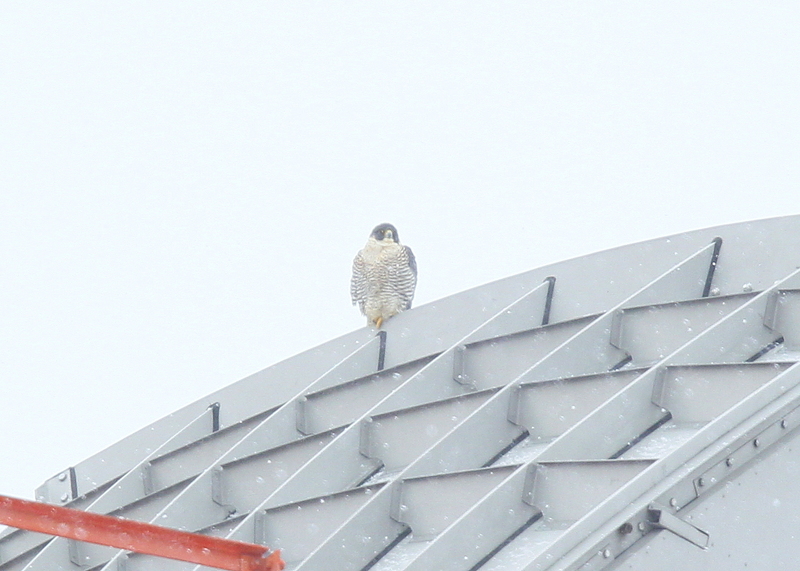 The very top of the Verizon Cell Tower has been a very regular cold weather perch for the peregrines. The are typically seen at this perch during coldest days of January until end of February when they tend to return to the Clock Tower.